Mardi Gras may be over, but that’s no reason to ignore New Orleans-style cuisine. It’s good any time of the year! So today we’re cooking jambalaya, which is pretty much every-day fare in Louisiana. And why not? It’s a one-pot dinner with outstanding flavor. Best of all, jambalaya is not hard to make. Most of the cooking is unattended, and you can prepare it ahead of time. That makes for a perfect company dish. It’s the big easy, you might say. 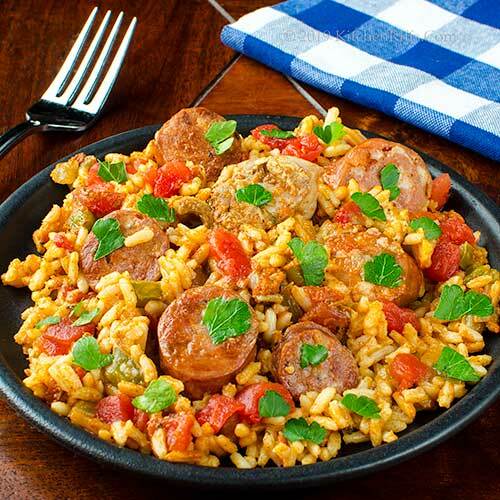 Jambalaya generally includes spicy sausage (particularly andouille), but you can use just about any protein you favor. We like to include chicken, though shrimp or crawfish are also common additions. In truth, however, jambalaya is all about the rice. That makes it similar to Spanish paella (some people think the dish was influenced by Spanish settlers in Louisiana). Why do we call this dish Creole rather than Cajun? Well, Creole recipes often use tomatoes as an ingredient, while Cajun ones almost never do (see Notes for more distinctions between the two). So a Creole jambalaya is “red,” whereas the Cajun version is “brown.” We love tomatoes, so our jambalaya is decidedly red. This recipe (like many Creole and Cajun dishes) uses the “trinity” of onion, green bell pepper, and celery. Precise measurements aren’t important, but you want a ratio of about 2:1:1 of onion to bell pepper to celery. Prep time for this dish is 20 to 30 minutes (including browning the meat). Cooking time adds 45 minutes to an hour. You can cook this dish an hour or two ahead, then keep it warm in a low-heat oven (see Notes). This recipe makes at least 8 hearty servings. Leftovers keep for a few days if refrigerated in an airtight container. Or you can use the leftovers to make soup (see Notes). Cut the chicken into pieces of 1 to 2 inches. Season to taste with salt. Set aside. Cut the sausage into ½-inch rounds or half rounds. Set aside. Place a large Dutch oven (one that holds at least 5 quarts) or another wide-bottomed cooking pot over medium stovetop heat. When it’s hot, add about 1 tablespoon of oil. When the oil is heated (it’ll shimmer; about 15 seconds), add as many pieces of chicken as will fit comfortably into the bottom of the cooking pot (you may have to brown the chicken in batches). Cook the chicken pieces until they are browned on one side (4 to 5 minutes), then turn the pieces and brown the other side. Drain the browned chicken pieces on a paper towel. Add more oil to the cooking pot if necessary, then brown the sausage pieces (this will take 5 minutes or so). Drain the browned sausage pieces on a paper towel. While the chicken and sausage are cooking, start the other prep work: Peel the onion and cut it into dice of ½ inch or so. Set aside. Wash and core the bell pepper, then remove the seeds and white membrane. Cut the pepper into dice of ½ inch or so. Set aside. Wash and string the celery, then trim the ends. Cut the celery into slices of ¼ to ½ inch. Set aside. After the chicken and sausage have been browned and removed from the cooking pot, add more oil to the pot if necessary. Add the chopped onion, bell pepper, and celery, season to taste with salt, and sauté for 5 to 6 minutes (until the onion starts to become translucent). Then add the garlic and cook for an additional minute. Add the tomato paste, then stir to combine it with the onion mixture. Cook for 2 minutes, stirring often – you don’t want the tomato paste to burn. Add the onion powder, garlic powder, oregano, thyme, black pepper, cayenne pepper, paprika, and celery seed. Stir to combine with the onion/tomato paste mixture. Then add the rice and stir to combine. Cook for about 2 minutes (you’re “toasting” the rice). Add the diced tomatoes and the chicken stock. Bring the mixture to a simmer. Taste the liquid and adjust the seasoning if necessary. Now is the time to add extra heat if you want a particularly spicy dish (we suggest Tabasco sauce). Do note that, as the rice cooks, it will absorb all the liquid – and all the flavoring in the liquid. So if you don’t get the spicing and seasoning correct now, it’ll be difficult to do so later. Add the browned chicken and sausage pieces to the cooking pot. Stir to combine with the rice. Cover the cooking pot and turn the stovetop heat down to low. Set a timer for 15 minutes. When the timer goes off, uncover the cooking pot and stir the rice mixture. Cover the pot again, then cook until all the liquid is absorbed (about another 15 to 20 minutes). Preheat the oven to 225 degrees F.
When all the liquid is absorbed, uncover the cooking pot and place it in the preheated oven. (This step is optional, but it does crisp up the rice a bit). After 10 minutes, remove the jambalaya from the oven. Serve, garnishing (if desired) with chopped parsley or chopped scallion greens. You can make this dish ahead, then keep it warm in a 225-degree F oven for an hour or two before serving. In that case, skip Step 15. Instead, after Step 14, place the covered cooking pot in the oven. By the time you’re ready to serve, the rice should be dry and crisp. Instead of using onion powder and other spices in Step 11, you could substitute about 2 tablespoons of Cajun or Creole seasoning mixture (such as the Tony Chachere’s brand). Be aware that commercial blends tend to contain a lot of salt, so you may want to use less salt to season the chicken and the onion mixture. We always use kosher salt for cooking. It’s less salty by volume than regular table salt (the crystals are larger, so they pack a measure less tightly). If using regular table salt, start with about half as much as we suggest. But always season to your taste, not ours. Tasting the cooking liquid in Step 12 is important – it’s easiest to adjust the final flavor of the dish at this step. We almost always end up adding some Tabasco sauce at this stage, but then we like spicy. Use a long-grained white rice in this dish. We particularly like converted rice, but use whatever you prefer. We suppose you could use brown rice, although we haven’t tried it. Cooking time will probably be about twice as long if you go that route. You can use either 2 or 3 cups of uncooked rice in this dish (and either 4 or 6 cups chicken stock). Two cups of rice means you’ll have a higher protein-to-rice ratio. Three cups of rice means you’ll have quite a bit more rice than protein. We think this dish is all about the rice, so we use three cups. Do remember, though, that 1 cup of uncooked rice makes about 3 cups when cooked. You can use almost any protein you like in this dish (exact quantity isn’t important, but you want somewhere between 2 to 3 pounds). Ham is a common addition. You can also use leftover chicken or turkey (if you go that route, skip the browning step). If you use seafood – shrimp, for example – we suggest you cook it separately and add it to the dish right before serving (so you don’t overcook it). Do use sausage, though – andouille if possible. Andouille is a spicy garlic-flavored sausage popular in Louisiana. You can find national brands of andouille that aren’t bad, though every locally made andouille that we’ve tried is better. As noted earlier, if you can’t find andouille, a spicy smoked sausage like kielbasa makes a good substitute. So, what’s the difference between Creole and Cajun? Well, “Creole” refers to the original European settlers of Louisiana (in particular, those from France and Spain). Cajuns are descendants of people who moved to Louisiana from French-speaking Acadia (located in what we now call the Canadian Maritimes). Cajun food tends to be rather rustic. Creole food, by contrast, tends to be more European-influenced (and often fancier). Because of that, Creole dishes tend to be more common on New Orleans restaurant menus. What about that jambalaya soup we mentioned? It’s a great way to use leftovers. Here’s how to make it: Cut up a fresh onion and brown it in a soup pot with a bit of cooking oil. And add some chopped garlic, and maybe some additional andouille sausage. Then add the leftover jambalaya, plus enough chicken stock to give it a soup-like consistency. We typically add some additional cayenne pepper and oregano to spice it up a bit, too. Simmer for 20 minutes and you’re good to go. “Of course, that’s Cajun talk,” said Mrs K R.
“No need to get all Creole about it,” I said. wow that's a long list of ingredients, but the result turned out so good..definitely worth all of the work. The spicy sausage sounds and looks very tempting. Hi Angie, a LOT of ingredients -- but many of them are spices/herbs. And although this dish does take just a bit of work (still a pretty easy dish, though), the flavor payoff is SO worth it! :-) Thanks for the comment. I love jambalaya but never make it because the smallest recipe would really feed a crowd, and there are only two of us, and even when I invite people, the crowd doesn't get big enough! There must be some way around this issue besides filling up my rather small freezer compartment. If I think of how to do it, I'd love to try your recipe! This takes me back to my trips there. I also have made this dish but not in a long time. Got to make me some jambalaya soon! I remember learning about the trinity in a cooking class took there. Love the idea to turn it into a soup wit leftovers. Hi Mae, this recipe does make a lot! You can make soup with the leftovers, and that freezes pretty well. But still . . . I do have an idea for making a small batch of this that's rather different (not made the traditional way) -- I need to work on that. :-) Thanks for the comment. Hi Evelyne, jambalaya is so good, isn't it? And fun to say. :-) Thanks for the comment. John, you outdid yourself in posting this recipe. No I know how to make a good jambalaya. I have never made one before. Thanks for the recipe. Hi Gerlinde, jambalaya is magic stuff -- worth making. :-) Thanks for the comment. I need to make Jambalaya more often. Your recipe sounds very authentic and looks so yummy on the photo. Hi Holly, don't you love this dish? TONS of flavor. :-) Thanks for the comment. So I was born in New Orleans and grew up in Houston. So I grew up loving Cajun cooking. 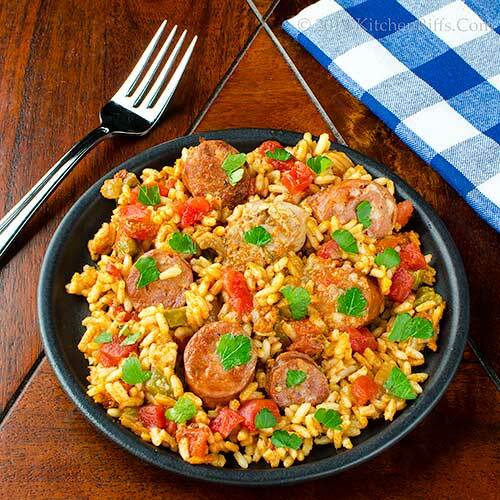 Your jambalaya looks amazing - one of my favorites! Hi Laura, jambalaya is terrific, isn't it? SO flavorful! Thanks for the comment. Believe it or not, I have never made jambalaya! I love spicy food so I'm not sure why. Trying this soon! A classic that everyone should know! You know me...I'm a fan of Cajun food. Looks great John! Hi Ashley, this is really good -- definitely worth trying. :-) Thanks for the comment. Hi Abbe, yup, you cook Cajun, and cook it well! :-) Thanks for the comment. Hi Bobbi, your boys would swoon over this dish! They'd want second -- thirds! -- for sure. :-) Thanks for the comment. I don't think I've ever had jambalaya but with all that flavor, I know I'd love it. This just might have been the original one-pot meal! So good! And it definitely should be made all year long. Hi Laura, it's a bit on the spicy side, so we love it! Thanks for the comment. Hi Dahn, we definitely don't make this nearly as often as we should. :-) Thanks for the comment. Hi Sherry, green jalapeño peppers are unripe, too (they eventually get red), but I'll never turn one down. :-) Thanks for the comment. Hi Anne, the nice thing about jambalaya is some people deliberately make it so there's a crust of rice on the bottom of the pot (basically overcook it just a bit on purpose). So no worries about cooking the rice -- it'll be good however it comes out. :-) Thanks for the comment. Well there is a dish even we across that Big Pond make often and about the same as you. . . Was going to make a paella next time the hordes arrived from town but this may be liked more. I do use the individual spices and a little more 'heavily' rather than any spice mixes . . . and SO agree about their usual salt content. Have to smile - have been to New Orleans for quite a few fun weekends twixt work further north and, yes, methinks Creole or even pure French food mostly has been on the table ! Hi Eha, paella and jambalaya are really rather similar, aren't they? Paella looks prettier, I think, but they both taste good. Jambalaya is lots spicier, though. :-) Thanks for the comment. John - I have never made jambalaya and have always wanted to since seeing Mrs. Doubtfire. Thanks for the recipe - it’s comming to our table soon! It really is similar to rice dishes from Spain (they even have brown paellas which sound similar to the Cajun style you've described.) I guess the main difference is the type of sausage used! I'll probably be thrown in Creole jail - I just redid an old recipe that I copy-catted from a restaurant in New Orlean - it has no tomatoes and I dubbed it Creole. I wonder if the restaurant had tomatoes in it and I forgot? Anyway - this looks great John. Hi David, it's good stuff. Enjoy. :-) Thanks for the comment. Hi Lydia, it is really similar, isn't it? Love 'em both! Thanks for the comment. Hi Lea Ann, although tomato/no tomato was traditionally a defining distinction between Creole/Cajun, my impression is these days the boundaries between the two are pretty blurry. In part because canned tomatoes are everywhere, no just in big city stores. :-) Thanks for the comment. You're making hungry for swamp food with this one. Being raised in the far Cajun side of the swamp, we more often had gumbo. But I have fond memories of eating jambalaya at my New Orleans born auntie’s house. Haven’t had it in ages so we’ll be giving this a go. Thanks for sharing. I am sure my husband would especially love this jambalaya. It looks and sounds wonderful. 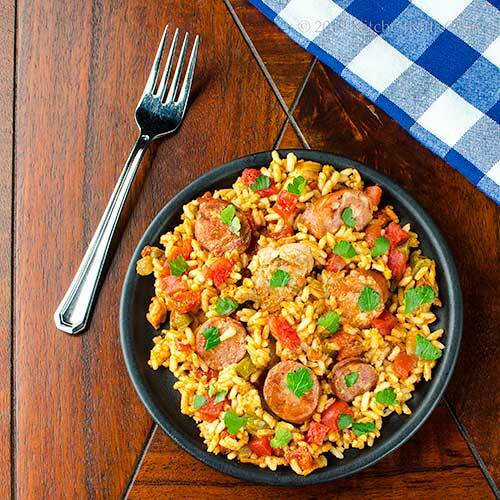 John, this jambalaya looks fantastic and so full of flavor! Love a one pot dinner! Hi Ron, I can never decide whether I like gumbo or jambalaya better! Both are SO good. :-) Thanks for the comment. Hi Rocquie, that's probably a pretty good way to distinguish between Creole and Cajun. Thanks for the comment. Hi Pam, your husband NEEDS this, and soon. :-) Thanks for the comment. Hi Kelly, one pot dinners are wonderful, particularly when they're as flavorful as this! Thanks for the comment. John, what a beautiful dish! 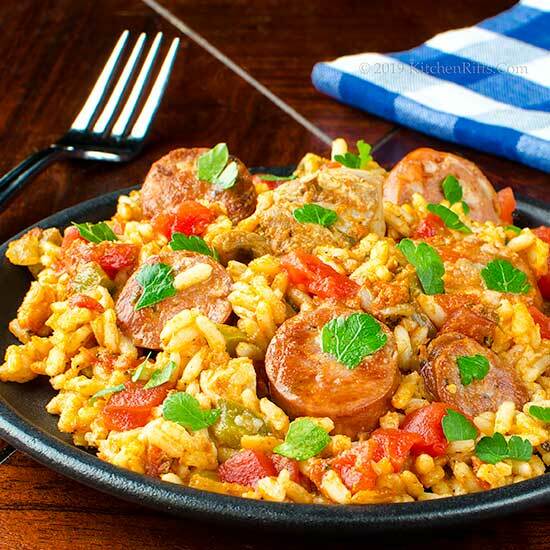 I usually skip over jambalaya recipes because I'm not a seafood fan, but this with the chicken thighs caught my eye. Going on my list of things to make soon! Hi Jean, we do like seafood, but think this version of jambalaya is better. :-) Thanks for the comment. Not everyone can enjoy seafood in my family, making this savory recipe a winner! Hi Deb, this is definitely a winner! Terrific flavor. :-) Thanks for the comment. Beautiful dish. Great for Mardi gras or any other time of the year. John, this is one of my husband favorite dish...and he always order it when on the menu. I am bias as I love all kind of rice dish, and this is not an exception, so tasty and yes, I like the spicy sausage. I'm with you - Jambalaya is not just for Mardi Gras. We eat it year round. It's been a while since I made one with chicken in a long time. Yours has definitely inspired me to change that. Yours look delicious. Hi Denise, we love this dish -- SO good. :-) Thanks for the comment. Hi Juliana, there's something so satisfying about rice dishes, isn't there? Thanks for the comment. Hi MJ, always happy to be an inspiration! :-) Thanks for the comment. I love this kind of food, but I never make it at home - so thanks for the recipe and the inspiration! Hi Jeff, this is so worth making next time you have a bunch of people over -- not too much work, can make it ahead of time, and sensational flavor. Winner! :-) Thanks for the comment. Hi Natalia, you should! Of course, once you make it, you'll want to make it the next week, too. And the one after that. :-) Thanks for the comment. Hi Valentina, one-pot meals are so nice to make, aren't they? And this is a really good one! Thanks for the comment. Mmmmmm.....I love these flavors! I'm sure we'll still have a lot of opportunities for comfort food meals before the weather warms up! Hi Liz, it's been warmer here for a week or so, but I'll bet we'll get more snow before spring fully arrives. :-( So good to have this recipe at the ready! :-) Thanks for the comment. Hi VIcki, this does indeed dance in one's mouth -- great description. :-) Thanks for the comment. It's been way too long since I've had jambalaya. This looks SO GOOD! Easier than flying to New Orleans to get my fix! Looks so scrumptious. Hi Kelsie, it's really good. Really, really good. :-) Thanks for the comment. Hi Carolyn, a LOT easier than flying to New Orleans! Thanks for the comment. Great recipe and always like your notes! Hi Debra, isn't this nice? Love the flavor of this! Thanks for the comment. Hi Amrita, jambalaya is good stuff, isn't it? :-) Thanks for the comment. Hi Marcelle, a road trip to NOLA is always a good idea! :-) Thanks for the comment. Hi Greg, we haven't been to NOLA in ages -- really need to get there again. And eat. :-) Thanks for the comment. Looks delicious, John! I love me a good jambalaya. And thanks for clearing up the difference between Cajun and Creole cookery. That's always been a bit of a mystery to me. Hi Frank, jambalaya is such incredible stuff, isn't it? Love it! Thanks for the comment. This NOLA dish is a real favorite at my household. Hi Denise, we love NOLA dishes! So good, aren't they? Thanks for the comment.